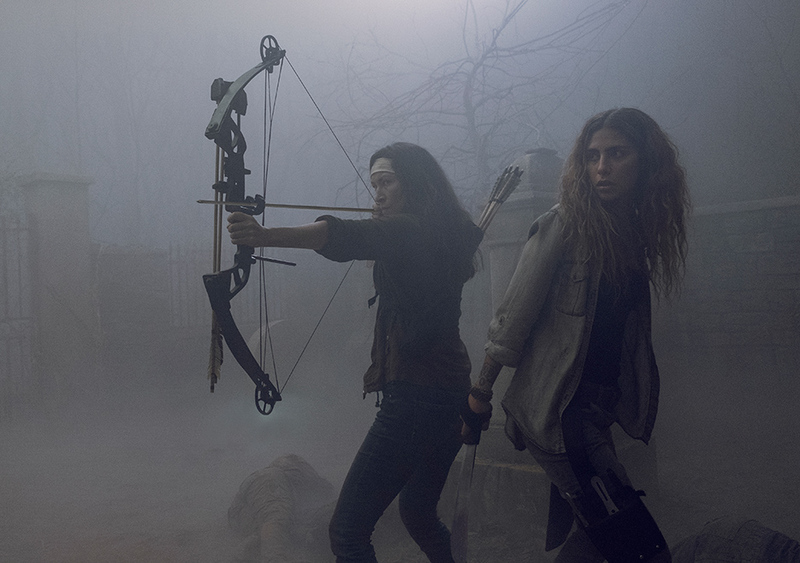 With only a few days remaining until The Walking Dead returns with the mid-season premiere, “Adaptation,” which is directed by Greg Nicotero, a new menace moves into the undead spotlight. The Whisperers have already left their marks among AMC’s survivors, getting violently introduced with the death of Paul “Jesus” Rovia in the mid-season finale, “Evolution,” but will this new enemy bring more viewers to the aging TV show? Season 9 should be the water mark for viewers, when ultimately deciding whether or not you like TWD. Lots of change has taken place… some of it good and some of it not so good. It’s about the only constant for this season, so far. Scott Gimple has been elevated to chief content officer, overseeing TWD and Fear The Walking Dead. Angela Kang took over as showrunner. More focus has (finally!) been placed on the storyline and dialogue, both of which had gotten very stale in recent seasons. Rick Grimes has been “killed” and at least for now, Maggie has been written out of the show (actor Andrew Lincoln will soon return in a series of TV movies and Lauren Cohan has moved on to star in Whiskey Cavalier, but her character’s fate has been left open-ended), but most likely both will return to the show at some point in the near future. Daryl Dixon moves into the spotlight, taking over (as actor Norman Reedus reportedly received a new $20 million contract for top billing), but can the grungy supporting character actually carry the already overpopulated ensemble? Overall ratings have been constantly dropping for The Walking Dead (and video game adaptations have also had a rough time, as well). While TWD is still basic cable’s top-rated show (Season 5 was the show’s peak, with 15.78 million viewers), longtime fans grew tired of the All Out War, preferring humanity’s battle with walkers instead. Conversely, Fear‘s ratings actually rose last year, as the spin-off was also retooled with all-new showrunners, writers and actors, heading into a terrific new direction (despite what a loud opposition has claimed). As seen in the previews for the remainder of this season, Negan is no longer imprisoned… will he soon be reunited with Lucille (Is he a good guy now?)? While there really was no “real” resolution for the All Out War, how will our heroes deal with this crafty, manipulative character running free? Also, there’s still sentiment from a portion of the remaining Saviors to reinstate Negan to lead their crew, while others seek new leadership. That situation should be interesting. Then there’s all the new characters that have been introduced this year, who will somehow get shoehorned into the overall storyline with all the rest. I’m hoping the Whisperers really thin the crowd, because there’s not enough dialogue or screen-time to go around for everyone involved. And there’s NEVER enough mega herds of walkers to take care of business. So, will ratings improve for the last half of Season 9? With everything that’s already happened (and the upcoming direction of the storyline still an unknown, along with the new characters and new roles for existing characters), it’s still a toss-up. Some viewers have claimed the show has already jumped the shark, which I wouldn’t deny, but it’s totally possible the mothership could follow the lead of its spin-off and quickly improve for the better, or else the audience will abandon in herds. Maybe even mega herds. We’ll have to see how it all plays out. We’ll be watching the rest of the season, will you? “Adaptation” airs on Sunday, February 10th, which is Episode 9 of the season.